This is a 2 lb 8.7 oz altar-sized cluster of Orange River quartz, 5” by 4.1” by 37”. Each of her crystals has a colorful, russet-red phantom, the color derived from hematite which has also distributed somewhat unevenly so that she is thoroughly accented with darker inscriptions. She is surrounded by a bevy of students, lightbrary style and you can see that the color was derived from a secondary growth over the hematite coating. It is somewhat uneven and there are areas revealing the original crystals. 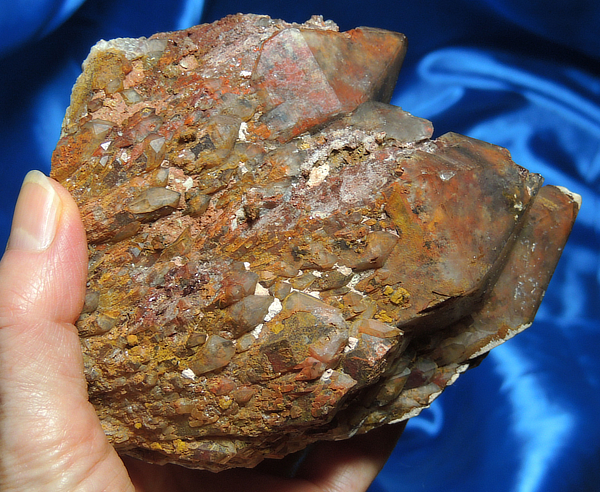 There are base and side contact areas, now totally healed and there are hematite-stained calcite deposits in some of the crevices. This is one Orange River cluster that will astound by what you see and what you feel with her! She may look a bit rugged, but actually, is in great condition. Red is the color of the Primal Chakra, the Chakra where we hold the sense of family, community and tribe. It is the center of our core beliefs and our Self. This is WHO we are when we are born, given our parents and our environment. Throughout our lifetime, we seek to define the Self – that which we become. We never lose that start for it colors a given lifetime. This Spirit is a Spirit with a solid core, yet an intensely clear expression. She represents that growth in Spirit as we mature into life. As an example, if we are born into a lifetime where our parents are abusive, it does not have to become our destiny. Once we realize that we can be different, we create our own way and grow in that realization: we manifest in a different expression! This Spirit is a celebration of Spirit plus an encouragement and reminder that we truly make our Selves on a daily basis. She is a lesson and a recognition of the power within!